The Curly Wirly Twirly Girlies: Freebie "wordart"
Okay so calling it "word art" might be stretching the definition a lot LOL. I realised today that one of the best sites for PSE tutorials I have found I had not put on the list on this blog. Big oops. Hummie's World is just fantastic. www.hummiesworld.com I think the many designers who share their work and art are so incredible, and so too are amazing ladies like this, who share their knowledge - what is that quote about teaching a man to fish ?? Anyway, I was most frustrated at not being able to make my words form a circle in PSE6. I am refusing to upgrade until I have mastered this because the full blown PS is supposed to be even more difficult - YIKES. So I checked on Hummie's tutorials (a whole stack are free), and she has a tute for how to do this. Yeah for Hummie. For the newbies like me - check out her blog for some amazing stuff she made for her son's college group. 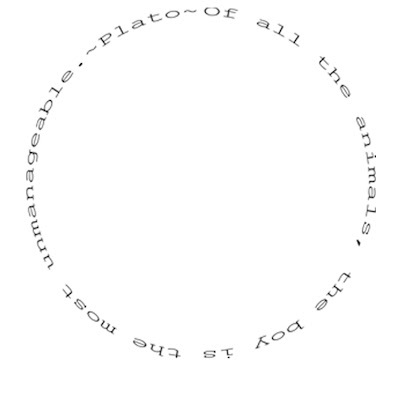 So I used a quote from Plato for one of my son's pages, and thought I would share the .png file for anyone who likes it. Thank you so much to everyone who has taken the time to leave a comment, they really do mean so much to me. And to all those other newbies, if I can do it, anyone can - trust on that - just dive in and play - the joy of digi - you won't wreck that expensive element or one off sheet of paper you've been saving. So here's the link for all those with rough and tumble boys in their lives. I may have to find and post a nice girlie quote to keep the balance. There are PSE6 tuts on youtube, download realplayer and you can copy the video to your computer to refer back to later (video has to be playing in order for the download to realplayer tab to pop up). I know one of the tuts is text on a path. Oh, my heart is melting now at reading your words. It blesses me to know I've blessed others. I will add you to the digiblog roll too...have you seen it? You don't know how much hope your comments give me! I've been surfing around looking at all of the creations of these amazing digital artists, growing steadily more intimidated. Scared to just jump in and 'play with it'. If YOU consider yourself a newbie, then I'm in the embryo stage! Well, I'm cranking up that good old PSE6 toDAY, along with the tutorial. I'm blown away by the community of talented and giving people in the digiscrap world. Thank you, and I did visit Hummies site too, and you are right there also. Lovely. Thanks again!